Here's my card for this month's My Favorite Things star themed Blueprints challenge. I used one of the sketches provided for the Blueprints 18 die set as the basis for this monochromatic masculine design. Once I picked the "high five" sentiment from the More Essential Sentiments set, I knew I needed some number patterned paper for my card. After finding a piece in an old Studio Calico patterned paper pad, I cut it to size and adhered it to a linen card base. I die cut the kraft panel using two of the Blueprints dies--one for the panel shape and one to add the dot detailing. The dots were backed with a strip of dark brown paper to set them off from the background. I adhered the kraft panel to the top of the number patterned panel using foam tape. I used the set's stitched circle die to cut a circle from dark brown cardstock. I placed the circle on the kraft panel, then added a pair of stars cut with the set's star die. The center star is popped up with foam tape. 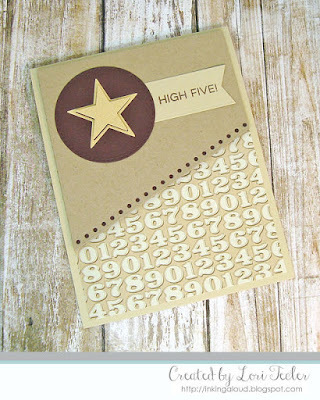 The "high five" sentiment was stamped in brown ink on a linen fishtail flag strip cut with another die from the set. To finish the card, I positioned the sentiment on the kraft panel, tucking one end underneath the brown circle.